On this site some persons are presented who turned against the German occupiers. They are a special group because the second common denominator lies in the Dutch East Indies (Indonesia). The Eurasian/ Indonesian share in the struggle against fascism is not very well known. In the first part of 2019 Herman Keppy will publish a book about this matter. If you have any comments, questions or suggestions, do not hesitate to send an email via the contact page. 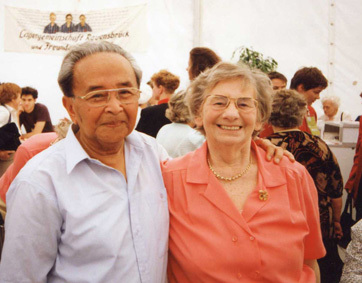 During the war, the mother of Rawindro Noto Soeroto was imprisoned in the Ravensbrück concentration camp. She reported that during a call on February 9, 1945 Mrs Dessauvagie, also from The Hague, stood beside her. This lady became unwell and was immediately separated from the others and gassed by the camp executioners. The archives of the Oranjehotel, the Scheveningen prison where she had been locked up, contains a photo of Juliana Wilhelmina Dessauvagie-van der Noorda (Makassar, March 27, 1885). 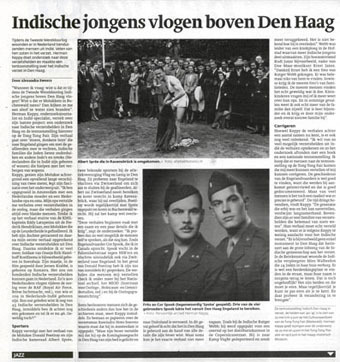 On the Internet I found information about her son Fred Dessauvagie (The Hague, April 3, 1918). He was an Engelandvaarder, (i.e. 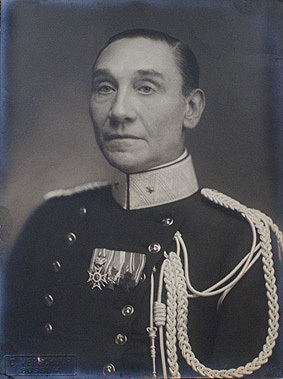 one of the many people who crossed over to England from occupied territory during the German occupation) and emigrated after the war to Australia. Do his children know why one day their grandmother disappeared, in ‘Nacht und Nebel’, as they used to say? This apparently happened in the wake of the arrest of KNIL captain Latuperisa and other members of the Ordedienst, the body responsible for order, according to a publication about this organization. Were possibly weapons hidden at Mrs Dessauvagie’s, or any persons? This is quite possible, as members of the resistance often sought help from family and friends. Since so many had Eurasian and KNIL connections, it makes sense that support came from their own circle. 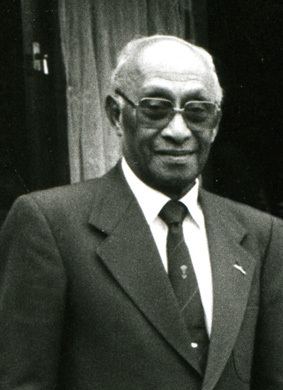 Navy Officer Charles ‘Sikki’ Douw van der Krap (Surabaya, October 8, 1908 – Wassenaar, December 9, 1995) was in office in Rotterdam when this city was bombed by the Germans on May 14, 1940. After the capitulation he refused to sign the German’s ‘Erewoordverklaring’ (statement of parole of honor) and therefore was put in prison. He was locked up in the notorious Colditz among other places and had thirteen escape attempts on his account when in 1943 the fourteenth, from Stanislau, finally succeeded. 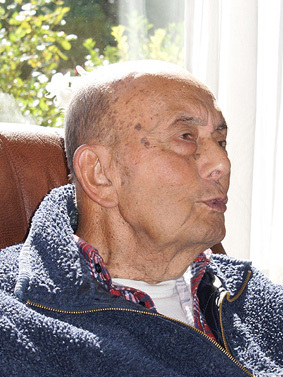 As a resistance fighter, he participated in the Battle of Arnhem and got involved in the successful flight of an allied group across the river Rhine (Operation Pegasus 1). Can you tell me who they were? How many were there, where they boys, Dutch, Indo? Like his cousin Anda whom he never knew, Hans Kerkhoven (Gambung, December 26, 1925) is a grandchild of one of the Tea Lords from Hella Haasse’s book (Dutch title: ‘De Heren van de Thee). After the Allied landings near Arnhem, Hans and his older brother got involved in the attempt to evacuate parachutists, a (failed) action that has become known as Operation Pegasus II. Emile Kerkhoven and his younger brother Hans guided a group of soldiers from Meulunteren (Veluwe area) across their own property for the purpose of crossing the river Rhine. 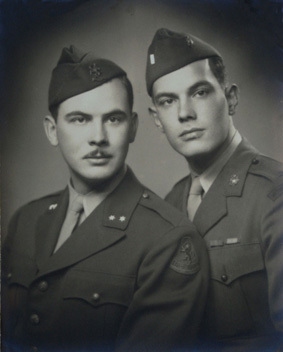 In the darkness of the night, the brothers lost sight of one another during an outflanking maneuver around a post with German anti-aircraft guns. Hans Kerkhoven: “I’d never heard from him again until we put an ad in The Times in London in August 1945 and a letter arrived. O, not just one, but a number of letters. I kept one of them, the letter from the physician who had been fetched by a parachutist who had found my brother. This physician nursed him. My brother was mortally wounded, to the extent that he was operated, according to this physician. He claims, however, that my brother had been taken into hospital in Ede, which was not true. He stayed at a German hospital in Apeldoorn and was eventually buried there. "Herman Keppy yang meneliti perlawanan warga asal Hindia di Belanda menegaskan bahwa para mahasiswa Indonesia yang menuntut ilmu di Belanda sangat sadar atas perkembangan dunia. Dalam penerbitan PI tertera bahwa mereka tetap memperjuangkan kemerdekaan Indonesia. Tetapi fasisme mengancam, jadi diputuskan untuk memihak sekutu melawan fasisme. Jadi terlebih dahulu mengalahkan fasisme, setelah itu baru memperjuangkan kemerdekaan Indonesia." Meet the Jewish sisters Emi and Mini Freibrunn (pictured in the foreground). 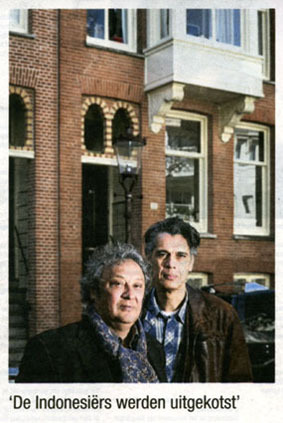 They lived in Amsterdam during the Occupation. They were brought to a place of safety in the Veluwe area by the Indonesian in the background, Rachmad Koesoemobroto. His Dutch fiancée, Nel van den Bergh (on the right), was arrested and killed in Camp Vught. The two sisters survived the war and currently live in Israel. 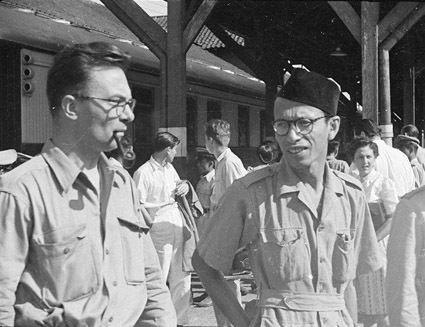 Bapak Koesoemobroto, a law student at the outbreak of the war, returned to Indonesia after the Liberation of the Netherlands and his own country. 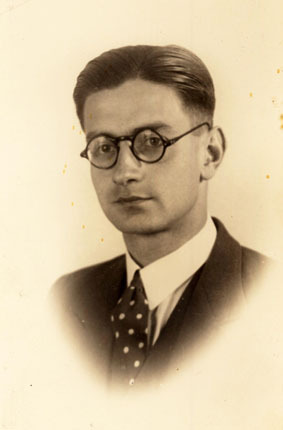 KNIL captain Eddy Latuperisa (Kudus, April 9, 1902 – Leusderheide, July 29, 1943) was in direct contact in The Hague with one of the leading figures of the (illegal)Ordedienst, the body responsible for order, Johan Schimmelpenninck. 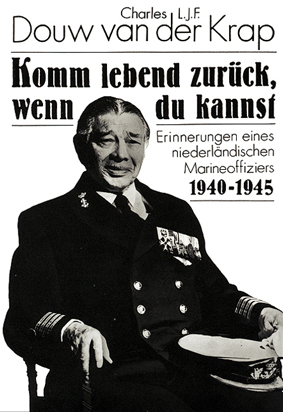 On behalf of Schimmelpenninck, Eddy Latuperisa organized bridge evening, among other activities, which were basically meant to let officers cadets and midshipmen (prospective naval officers) join theOrdedienst. He was also supposed to take care of weapons and an arms cache, with Schimmelpenninck’s money. Latuperisa was involved in the attempt of three men (the Indian Peter Tazelaar, Wiardi Beckman and Frans Goedhart) to flee to England from Scheveningen on the night of 17 on 18 January 1942. This attempt failed, Tazelaar escaped the German soldiers, but the other two were arrested. 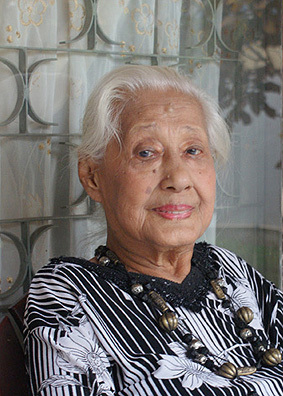 Loebis, a family doctor of Batak descent, married Jo Soumokil, a Moluccan, in 1941. 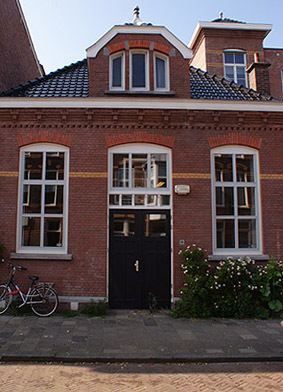 They moved into a house adjoining a practice in Amsterdam, where three months later, on June 26, 1941, he was arrested by two Dutch plainclothes officers. Via the camps Schoorl and Amersfoort, he survived the horrors of several concentration camps in Germany (Buchenwald and Heinkelkamp near Sachsenhausen). The Loohuizen family lived in the Bomenbuurt (Tree Area) in The Hague. 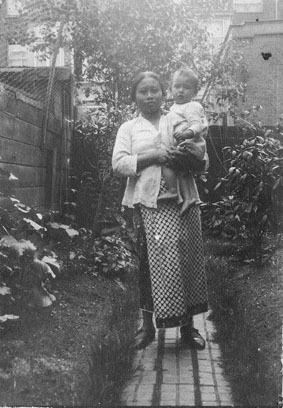 Fons Loohuizen’s father was a native Dutchman and his mother a Moluccan, called Anaatje Magdalena Noya). One of their sons, Alphonso Julius (Semarang, April 30, 1917) who was called ‘Fons’, managed to get to England during the war, where he was trained as a pilot. He actually came into action for the 320 Squadron of the RAF. During a raid on June 24, 1944, the Mitchell in which he flew was hit by Flak guns over Chateau d’Ansennes. The aircraft had not dropped the bombs yet and exploded. Fons and his colleagues did not have the ghost of a chance. 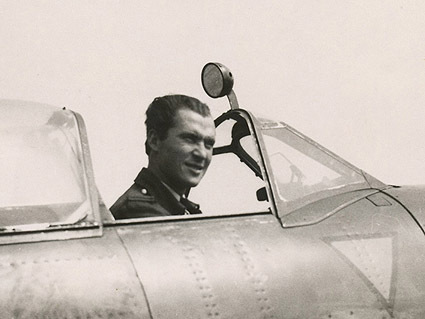 What genius thought was behind the idea to parachute an unmistakably Eurasian-looking radio operator over Steenwijk? In order not to attract attention among the fair-haired farmers? 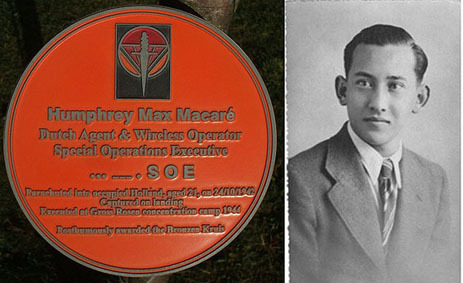 We will never know how things would have worked out, since on the day of his dropping , October 24, 1942, Humphrey Max Macaré (Bandung , October 12, 1921) was already met by a German reception committee that, thanks to the at full steam operating Englandspiel, had been informed of his arrival. Macaré was taken prisoner and eventually deported to Poland, where he was executed on April 30, 1944. During the war, Gitel Münzer, a Jewish woman in The Hague of Polish origin was looking for a place to hide her children. Her two daughters were lodged with a Catholic couple. Then she had only to find shelter for her nine months’ old son. 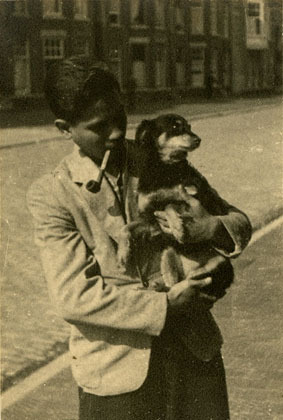 When he was asked to take care of Alfred Münzer, the Indonesian Tolé Madna (Maos 1898-1992) did not hesitate one moment. He and his nanny Mima Saïna took the little boy under their care for three years. The Münzer girls, however, were reported by the husband of the couple who had taken them in. They were deported and gassed. Their father died in a concentration camp elsewhere. Gitel, however, returned from camp Ravensbrück and could stay with Tolé Madna to enable her son could get used to her. Mother and son later moved into Gitel’s own apartment. In the fifties, she emigrated to America, but always kept in touch with the Madna family. 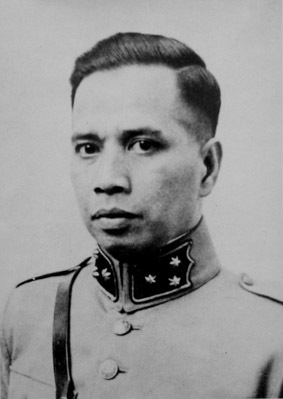 During the war, resistance fighter Gerard Dogger was assigned a cadet sergeant as his bodyguard. “His name is Makatita and he is pitch-black, from the West. He’s a cheerful guy with a great sense of responsibility. His Dutch, however, is still flawed,” wrote Dogger in his memoirs. Makatita, however, was not from the West at all, but came from the East. 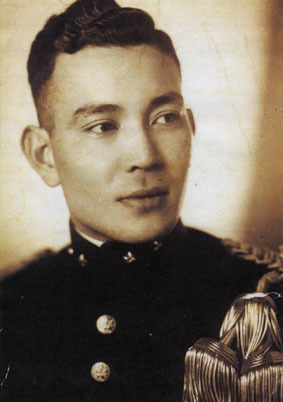 He was a Moluccan, born in Batavia on April 30, 1919. Whether his Dutch was that flawed is very doubtful, for besides the fact that he already studied at the Royal Military Academy, at home they spoke Dutch, possibly with an Indian accent. Makatita played soccer for HV&CV Quick in The Hague, another Dutch-speaking environment. Makatita, a fellow cadet and a journalist also undertook the dangerous journey. The route they followed through France, however, was known to the Germans. Another group of refugees had previously been intercepted near Dijon. The same happened to Makatita and his friends. They were executed on April 9, 1942..
Like his brother Arie, Jan Nout (Semarang, January 7, 1920) was a member of Ordedienst, the body of officials responsible for order that early 1942 threatened to be rounded up rapidly. Jan ended up in the Oranjehotel and hence taken to Sachsenhausen, where he was executed. Not until eight months after his death did his mother, Lien Nout-Mandagi, receive his farewell letter. 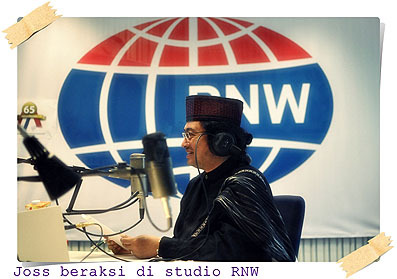 Evi Poetiray (Besoeki, January 13, 1918): “We, Indonesian students, were very intimate with the makers of the illegal papers Vrij Nederland, De Waarheid and Het Parool. At the time, one of the Indonesian students, Irawan Soejono, was shot in Leiden during such a transport. It was very dangerous, but I was young and not afraid. When I’m thinking of the war, I’m thinking of hunger, hunger, hunger. Maybe you can write a funny story about this. There was a time when all we got every day was a bowl of potato peel soup. Well, at least it was hot. And you got a loaf of bread that had to last a week. With ration coupons you could get some sugar, potatoes and coal. When Irawan Soejono was killed in Leiden, we went to Leiden by bike: three boys and three girls. We, the girls, on the back, ‘bonceng’ (hitching a lift), on bikes without tires. One of the women, Elly Soumokil, had a three-month-old baby, but she just had to go to Leiden. She had taken her son to a cousin at the Wilhelmina Hospital in Amsterdam and then left for Leiden. 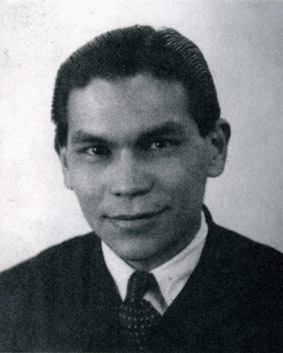 The Moluccan boy Henk Poetiray turned 18 in The Hague on March 19, 1942. He disappeared a few days later. After some time, his family learned that he had arrived in Switzerland with much difficulty. From this country Henk and his friend Paul van der Bilt fled across the Dolomites. The Italian gendarmerie, however, arrested the boys and handed them over to the Germans. 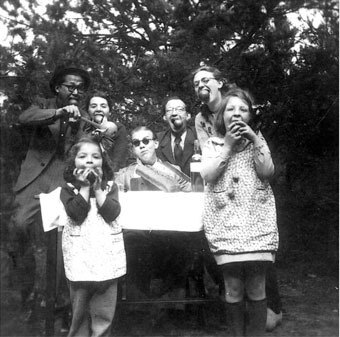 Henk ended up in Berlin, where he had to work in a factory. He witnessed the terrible bombing on the city and the fierce battle from street to street. He was eventually liberated by the Russians. 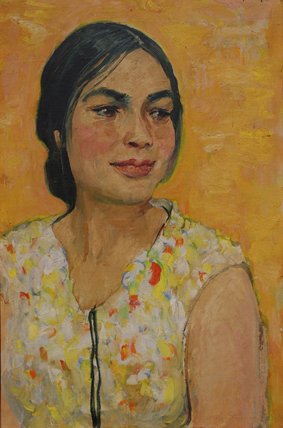 After the war, Henk Poetiray emigrated to America, where initially he made a career, until post-war trauma started troubling him. During his last years, he became a man who tolerated only few people and only few people tolerated him, much to the chagrin of his family and friends. How a war destroyed a sweet and brave boy. 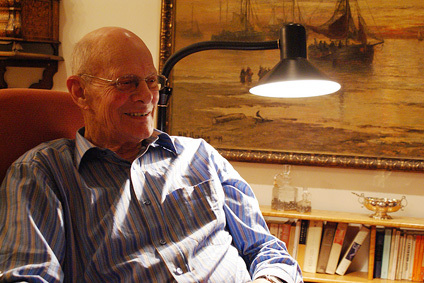 On August 30, 2014, Henk Poetiray died in Denver, Colorado, 90 years old. "Pada bulan Juni 1941, Sicherheitsdienst (SD) dari kaum nazi mengadakan penggeledahan di berbagai tempat tinggal mahasiswa Indonesia di Leiden. Mereka mencari empat anggota pimpinan dari grup perlawanan Indonesia 'Perhimpunan Indonesia'. Dua di antara mereka tertangkap, yaitu R.M. Sidartawan dan P. Lubis, sedang yang lain dapat meloloskan diri. Pagi-pagi hari tanggal 18 Januari 1943 SD mengadakan penggeledahan kembali di tempat tinggal orang-orang Indonesia di Den Haag. Mereka menangkap dua orang mahasiswa dan dua orang buruh: R.M. Sundaru, R.M. Djajeng Pratomo, Kajat, dan Hamid. Empat orang tawanan ini diseret dari kamp konsentrasi yang satu ke kamp yang lain: Schoorl, Amersfoort, Vught, Neuengamme, Buchenwald, Oranienburg-Saxenhausen, Dachau. Dua orang dari mereka tewas karena siksasn dan penderitaan di kamp-kamp tsb. Sidartawan di Dachau dan Mun Sundaru di Neuengamme." “The Sicherheitsdienst (SD) of the Nazis raided an Indonesian student house in Leiden in the month of June 1941. They were looking for four members of the board of Perhimpunan Indonesia (Indonesian Association). They had already arrested two of them, Raden Mas Sidartawan and Parlindoengan Lubis, somewhere else. 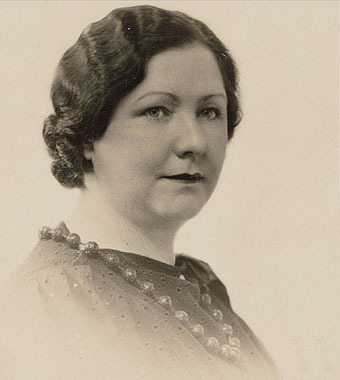 Mimi Saïna was employed by the Madna family in The Hague as a resident nanny. However, Tolé Madna divorced his wife in 1936. Two daughters stayed with their mother and the son went to live with the nanny and the father. Five years later, the father, Tolé Madna, was asked to take care of a nine-month-old Jewish boy and he did not hesitate one moment. For three years, he was a father and Mima a mother for the boy. Tolé's son became the older, caring brother. When Alfred’s birthmother returned from the war, the boy had no memories of her. To enable her son to get used to her, she was asked to move in with the Madna family. Tragically enough, Mima Saïna suddenly died a few months after the return of Alfred’s mother. Alfred still remembers mama Mima singing the lullaby Nina Bobo for him. They are together in the picture above. 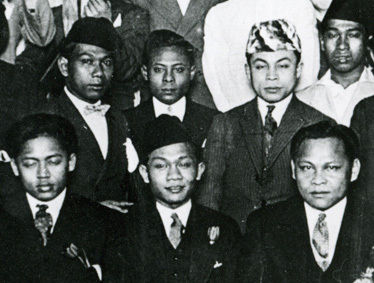 When in hiding in Amsterdam, Raden Mas Setiadjit Soegonda (Dengon, June 7, 1907), chairman of Perhimpunan Indonesia, directed the Indonesian resistance in the Netherlands. 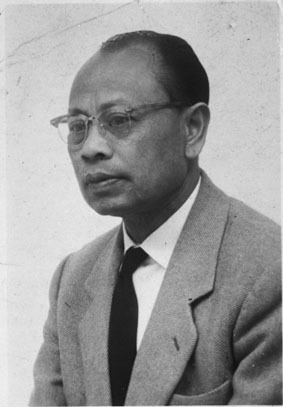 In addition to leading the Indonesian resistance organization, during the war Setiadjit wrote articles for Vrij Nederland, among other papers. After the war, he got a seat in parliament, but soon left for Indonesia, where he took on the presidency of the socialist Partai Buruh Indonesia. He was appointed vice president in the Sjarifoeddin cabinet. 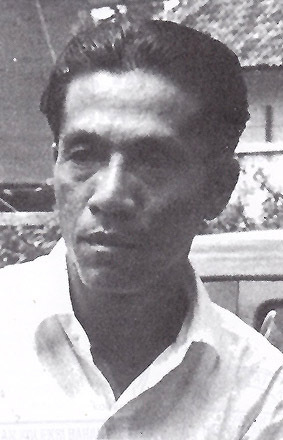 During the suppression of the communist rising under Muso, with whom he had sided, Setiadjit was killed by the TRI, Tentara Republik Indonesia (the Indonesian Republic Army) on December 20, 1948. After the massacre in the Java Sea, corporal engineer Wim Siahainenia (Kwari, June 21, 1914 – Den Helder, April 21, 1987) evacuated and fled to Colombo aboard the minesweeper Willem van der Zaan. He then left for Scotland to work as a stoker aboard the submarine O 15. He had his most anxious moment after an attack in a Norwegian fjord. “We were met by a German squadron and, with intervals, were bombarded with depth charges for eighteen hours. Fortunately, there was a strong current, which enabled us to escape sailing very quietly, only using our electric motor. This is called creep speed and all you hear are the screw propellers above and all those explosions. I was the only Amboinese aboard the submarine, but there were also Javanese and Medanonese people. In 1941, Frits is the first one to leave, but not after he had taken care of forged identity documents for his brothers Nico and Cor, which enabled them to travel through France. Nico, Cor and a friend started their escape to England in 1942. The provisions they took were rye bread, cheese and honey. Clothes? Only what they were wearing. Albert ‘Ab’ Spree (Magelang, September 18, 1922) was a national top sprinter of V&L (Vlug en Lenig), an athletic club in The Hague, national junior champion in 1939, 1940 and 1941. 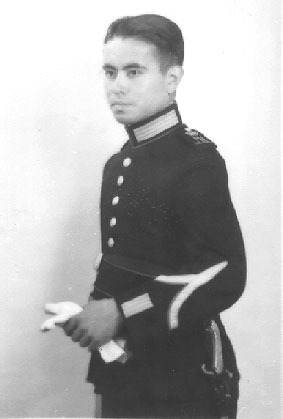 During the war, he fled the Netherlands with his V&L buddy Donald Poetiray, attempting to reach England via Switzerland. Their aim was to join the Allied Forces. Unfortunately, their attempt failed. Donald ended up in Buchenwald, but survived. His Eurasian friend Albert Spree died soon after an illness in camp Ravensbrück on July 29, 1943. Lieutenant Colonel of the Royal Military Police Pierre Versteegh (Kedoengbanteng, June 6, 1888 – Sachsenhausen, May 3, 1942) was famous as a dressage rider. He was a member of the Dutch team that won bronze at the Olympic Games in Amsterdam in 1928. 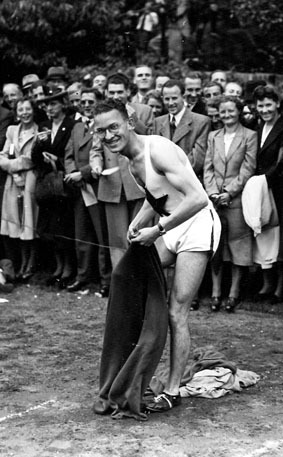 He also performed in two disciplines during the 1936 Games in Nazi Germany. In the early days of the Occupation, Versteegh, an Indo, was appointed chief of staff of the (illegal)Ordedienst (OD), the body of officials responsible for order, but not for long. 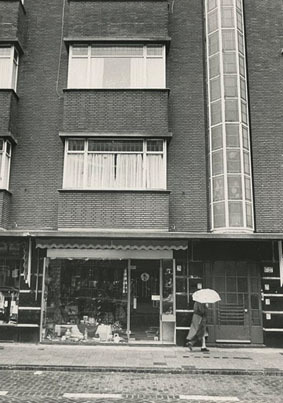 He was soon arrested in his home in Bussum, on the very day his daughter got married. After a lawsuit, known as the first OD process, he was sentenced to death and executed in Sachsenhausen on May 3, 1942. One of those pilots who didn’t return was Frans Loohuizen. You knew him, didn’t you? Regarding Van Loohuizen, no parachutes, I assume? You still remember it exactly, so it made quite an impression on you? The above quote is from the Weinreb report that was published in 1976. Sara Maria ‘Mies’ Walbeehm (deceased in 1981) was an Eurasian nurse, who, for her commitment to these people in hiding, was tortured in Scheveningen prison and interned in camp Vught. In 1944, however, she was released, which did not stop her from concerning herself about people in hiding again. The lawyer Rutger Webb (Sigli, November 2, 1914) was the leader of the commando group that raided a distribution office on Copernicusstraat in The Hague on August 24, 1944. The hold-up was successful, but Webb was arrested. Rutger or ‘Tutti’ was the bosom friend of Rudi Jansz’ (the father of the musician Ernst Jansz) who initially was also a member of the commando group.